JWK CA My ceiling came out beautifully. I read all the comments and used all of the suggestions. I added primer before using the texture and made sure the house temperature was in the recommended range. It did take a lot longer than 2 minutes for the product to set up. I used the Homax Knockdown knife to smooth the texture. I will use again and recommend to others. mangoz We took out the kitchen cabinets to install open shelving and found...unfinished walls. Since we have "knockdown" finish we shopped around and found Homax. and this product saved the day. I have to agree with momof5 on this one. It was easy to use and a toddler could have applied it. Thanks so much!!! momof5 Based on others poor reviews, I thought i would give my opinion. I am a total DIY person and never call a professional if i think i can do it myself. I needed to repair a few spots in our laundry room that puppies had clawed holes in. After filling with Dry Dex and sanding, i got my can of Homax, read the directions, even watched a few videos and started to spray. My can sprayed fine with a continuous spray. I waited for the shine to go away and then proceeded with the knock down. Results are amazing and match the wall perfect! Cant wait to paint! tlm I found this version of the product to a notable improvement over the stock DIY product, with better control and pressure. I used it for a heavy knockdown repair area (approximately 4x8 area). Worked *very* well. Haccou Hi Just wanted to share this: my husband and I removed some wallpaper in our dining room to find that the wall underneath had never been textured. We considered a 5 gallon vat of texturing paint, but the hardware guy recommended your product (Pro-grade Knockdown). Great product! It was so easy to use, and gave us great results. We are not pros by any means, but this was so easy. Thank you! jimm You can't realistically practice - you'll waste a can. Unless you are only doing a small repair buy 2 cans - still cheaper than a contractor. For the first 2 minutes of spraying it was a disaster, too wet almost running increased pressure to max helped much. As the can was running 1/2 empty increased spray to heavy - worked well. Not ready to knockdown in 2-3 mins, try maybe 5-8 mins and that depends on humidity. KD as you see gloss disappear, best tool is a piece of plastic similar to a credit card. tim88 The product worked well for the light and heavy knockdown texture. I had to be shaking fairly often to keep the material flowing but I was able to use the entire can. The only problem was the plastic top of the container was broken in shipping and it took super glue and duct tape to keep it together long enough to use the can. Mitchell I was able to actually get it to spray . Although that was a challenge . Result was good but , this got in part of my cabinet and it will not come off . It has left a white stain . Almost like it melted into the finish . Seriously would like to know how to remove it ? Chicagoguy I bought this product today from a big box retailer, and I have wasted $20. I watched every video online and followed the directions to a tee, yet I spent more time wiping the product off the wall than I have finished product. There is hardly any propellant in the bottle thus I have a half full can and cannot use anymore of it. I am not a fan and will not be purchasing anymore of this product. 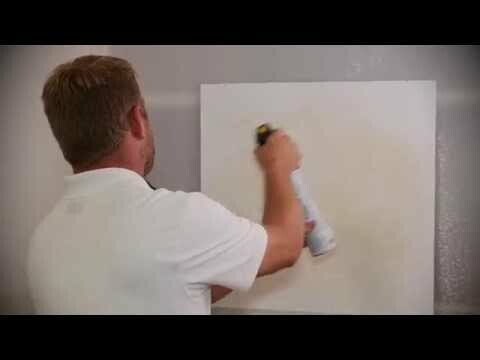 Jefff I purchased this product to cover repairs on my walls before painting. The spray would only come out for a few seconds at a time then the pressure dropped and it would just dribble. Lots of shaking later and it would spray again for a few seconds. I spent more time cleaning up the floor than actually working the wall. I don't know how this has been tested but I'm extremely disappointed. Homax Pro Grade Knockdown Wall Texture with Dual Control™ Technology is the latest innovation in aerosol textures. This professional tool features adjustment of both pattern and pressure– similar to that of a hopper gun. Convenient and simple to use without the hassle of mixing or using a compressor. The NEW heavy-bodied Knockdown formula is tinted for improved visibility during application. No prime feature saves the Pro time. Simply spray, “knock down” with a mud knife and paint to achieve an invisible, professional repair. Low odor, water-based Pro Formula is easy to apply and clean. Ergonomic grip handle helps reduce fatigue. 25 oz. covers up to 75 sq. ft.
Knockdown or “Southwest style” textured walls are beautiful, but can be challenging to patch and repair. Blending in the new knockdown texture with the old is critical to achieving a professional, flawless finish. Homax makes it easy to repair knockdown textured walls with our popular aerosol texture products for PRO users. NEW Homax® Pro Grade Knockdown Wall Texture with Dual Control™ Technology is the latest innovation in aerosol textures. This professional tool features adjustment of both pattern and pressure– similar to that of a hopper gun, making this product convenient and simple to use without the hassle of mixing or using a compressor. The NEW heavy-bodied Knockdown formula is tinted for improved visibility during application and the no prime feature saves the Pro time. Simply spray, “knock down” with a mud knife and paint to achieve an invisible, professional repair. The low odor, water-based Pro Formula is easy to apply and clean, while the ergonomic grip handle helps reduce fatigue in your hands. Covers up to 75 sq. 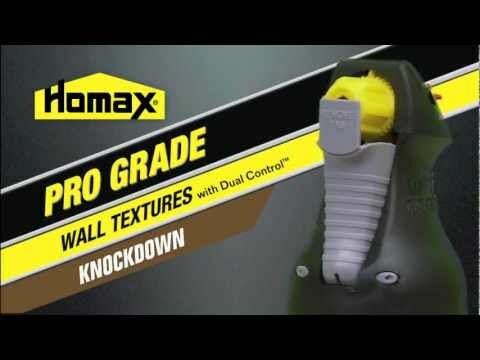 ft.
Homax® Pro Grade Knockdown Wall Texture with Dual Control™ Technology is a time-saving tool that provides portable and convenient delivery of a full range of interior knockdown textures to allow you to achieve professional repairs. FIRST AID: If swallowed, do not induce vomiting. Get medical attention immediately. For eye contact, flush thoroughly with water for 15 minutes and get medical attention. For skin contact, wash thoroughly with soap and water. If inhaled, remove person to fresh air. If breathing does not improve, get medical attention.